Actually this is not a macaron but vrai Parisien Philippe, expert instructor for the pâtisserie class I took last Saturday, entirely devoted to the making of the perfect macaroon. The venue was the Lenôtre amateur cookery school in the grand looking Pavillon d’Elysée in the heart of Paris’ 8th arrondissement. On the agenda were three classic macaroon recipes: vanilla, coffee and chocolate. I’m feeling too lazy to write up all 3 recipes in full, so here they are as photos. 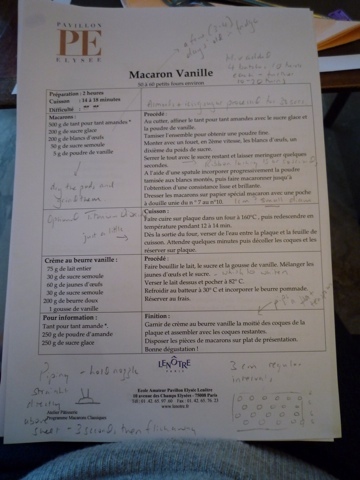 I’ve translated and annotated the base vanilla recipe below, but have taken the liberty of halving the quantities to make the numbers more manageable for the home baker. 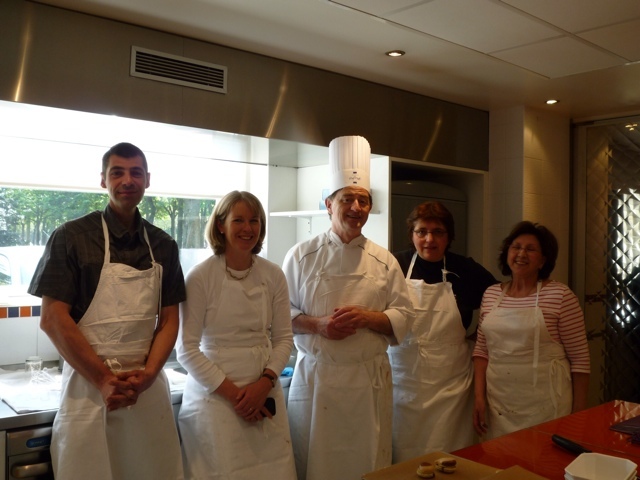 My fellow course participants were 3 Parisian ladies and 1 man who turned out to be a professional pastry chef. I decided to share my workbench with him and pick up some extra tips. The 6 of us shared a spacious kitchen nattily decorated with orange walls, sleek white cabinets and lots of chrome and stainless steel. Chef Philippe was a little stern at first and asked for no photography. As the morning went on, he gradually warmed and melted and by the end of the session, the no photography rule was relaxed as you can see. All was of course in rapid Parisian French. 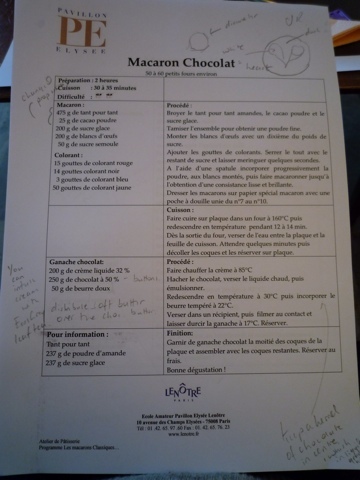 This was clearly going to be a workout for my schoolgirl French as well as honing my pâtisserie skills. 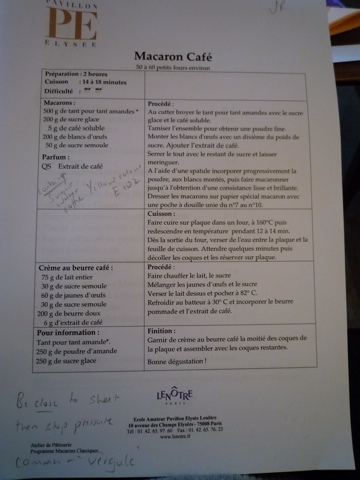 1) All the recipes include a mystery ingredient “tant pour tant amandes” which is nothing more than a 50:50 mixture of ground almonds and icing sugar. This is a mix that the professional pastry kitchen already has on hand as it’s the starting point for a number of recipes. It’s not something that the domestic cook needs that often so I’ve restated the recipe in terms of the underlying quantities of ground almonds and icing sugar. 2) The base recipe specifies vanilla powder rather than the more usual extract or paste. Ever wondered what to do with old vanilla pods other than them into a jar of caster sugar? Once the old pods are thoroughly dry, you can crush them in a spice grinder/ mini food processor to make a fragrant powder perfect for use in baking. I haven’t tried this at home yet but will give it a go with my next batch of old pods. 3) The egg whites are weighed for an accurate result. A medium egg white weighs a little over 30g so you’ll need 3 eggs for the base recipe I give below. 4) I need to mention the nasty subject of additives. Although not listed amongst the ingredients, Chef Philippe casually added a couple of pinches of white food colouring to his macaroon mix. On closer inspection, this turned out to be E171 titanium dioxide. At best this seems entirely unnecessary – the finished macaroons were an attractive toasty gold colour – and at worst possibly dangerous. Philippe also added yellow food colouring to his coffee macaroons, again not in the recipe, and again unnecessary as the coffee extract used to flavour the macaroons (make your own by dissolving instant coffee granules in a very little hot water or consider that old standby Camp Coffee Essence) will also lend them a little colour. Finally, the chocolate macaroon recipe specifies a massive 82 combined drops of black, red, blue and yellow food colourings to turn the mix into the requisite rich dark brown. When I try these at home, I will make do with a more delicate brown colour provided by the cocoa powder alone. 5) I learned to use a much smaller piping nozzle than the one I’d used previously. The recipe specifies nozzles in the range between nos. 7 to 10. I’d estimate that the one we used in the class was about 12mm in diameter. 6) We used very convenient big disposable clear plastic piping bags. I’ve stocked up on these to bring home with me. 7) We used a powerful professional food processor to pulse the ground almond and icing sugar mix. I’m not sure if a domestic processor works quite as well but I’ve had good results from my Kenwood liquidiser. 8) Talking of my Kenwood mixer, this was the machine of choice in the Lenôtre kitchen. Chef Philippe prefers it to the more modish Kitchenaid. 9) To bake the macaroons, we used doubled-up (one stacked on top of another) baking trays lined with unbleached non-stick baking paper, again just like the stuff I use at home. The double trays mean a more even heat distribution. 10) The most versatile kitchen tool we used was a little plastic scraper, the kind used for bread making. This was a fantastic stand-in for a spatula and dead handy for filling piping bags, emptying bowls, rubbing ground almonds through a sieve etc. I’ve brought one of these home with me too. 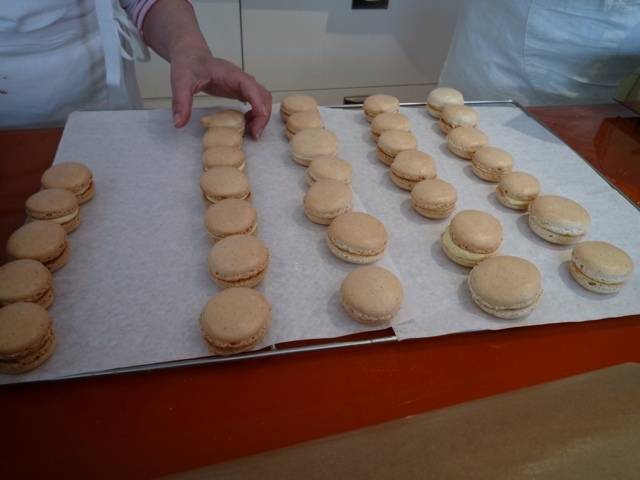 11) The consistency of the macaroon mixture is key to the shape of the finished product. The ground almond and sugar mix was folded into the meringue mix using a spatula in three phases, with 10 turns of the bowl for each addition. Then comes the key final mixing with a spatula, a further turning and folding of the mixture until it becomes smooth and glossy, holding its shape but only just. There is a special word for this final mixing “macaronner”. If you don’t get it quite right, the mixture will be too stiff and the piped discs won’t flow to a nice flat circle and will have little tails instead of being smooth on top. 12) When piping the discs, hold the tip of the nozzle directly above (90 degrees) and very close to the baking tray. Squeeze using the palm of the right hand against the top of the piping bag for a count of 3, stop the pressure then execute a quick flick of the wrist as if writing a comma with a fountain pen to release the nozzle. 13) Pipe in neat rows and keep a good distance (3cm or more) between the discs in order to ensure a good airflow and even baking. We piped 28 discs on a tray, a row of 6 then a row of 5 in the gaps, another row of 6, another of 5 then a final row of 6. 14) To ensure that the cooked discs with their still soft centres peeled off the paper easily, we carefully poured cold water onto the hot baking tray as soon as it came out of the oven. To do this, you need to set the tray at a slight slant over the sink and carefully lift up the edge of the paper before pouring water beneath it from a small jug. 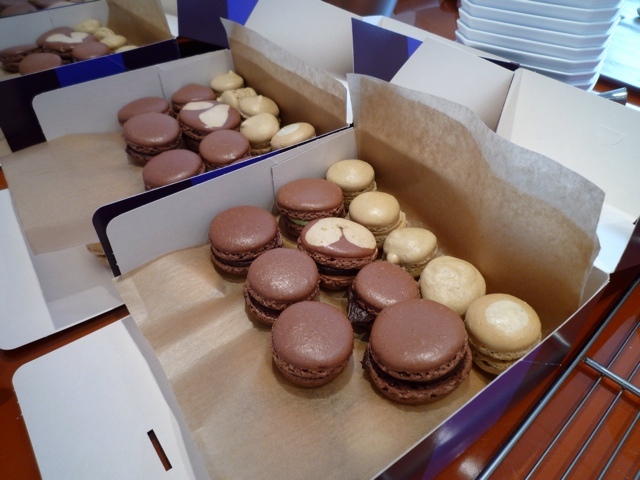 15) I’ve never paid special attention to filling macaroons previously. I’ve simply spread them with buttercream using a small crank-handled palette knife. I’ve now learned to make a silky-textured buttercream with a crème anglaise base which is piped onto a macaroon disc in a similar way to piping the disc itself. Sandwich with a second disc, press lightly and you have a level filled macaroon with a perfectly even line of filling around it’s circumference. 16) Finally, the completed filled macaroons should be left to mature overnight in the refrigerator before eating. As if! Apparently they can be frozen successfully if you need to make a big batch for a wedding, party, family celebration or similar. Mix the ground almonds and icing sugar together. Liquidise or pulse in a food processor for 10 to seconds and push the resulting mixture through a sieve. Put the egg whites into a mixing bowl with about one tenth of the caster sugar. Begin whisking at a medium speed (level 3 on a Kenwood electric mixer) until the mixture reaches the soft peak stage. Gradually whisk in the remaining caster sugar and whisk until the mixture becomes a smooth, glossy, stiff meringue. Gradually fold in the sieved ground almond and icing sugar mix using a spatula. Do this in 3 or 4 batches. Continue to fold the mixture with the spatula until it becomes smooth and glossy and a little looser but not too runny for piping well. Using a piping bag fitted with a nozzle in the range 7 to 10 (10 to 15 diameter) pipe individual macaroon discs 2cm in diameter onto a tray lined with silicone paper. Space them at least 3cm apart. Leave the macaroons to dry for 15 minutes or so before baking. Place a second tray beneath the macaroons than place in an oven preheated to 160 degrees C. Turn the heat down to 140 degrees C and bake for anywhere between 12 to 18 minutes until the macaroons have puffed up a little and have coloured lightly. They should have cooked, crisp bases but still be soft in the centre. Start checking after 12 minutes. Remove the cooked macaroons from the oven and immediately pour a little cold water onto the hot tray UNDER the baking paper to form steam and help release the macaroons from the paper. Allow to cool for 5 minutes or so then remove from the paper onto a cooling rack with help of a small crank handled palette knife. Leave to cool completely before sandwiching together with piped vanilla buttercream. Heat together the milk, 15 g caster sugar and the vanilla pod. Bring to just below boiling point then remove from the heat, cover and allow to infuse for a few minutes. In a large bowl, using a balloon whisk, whisk together the egg yolks and the other 15g sugar until the mixture lightens in coloured just a little. Remove the vanilla pod, scrape out the seeds and add to the mix. Pour the warm milk over the egg yolks and sugar and whisk together. Return the mix to the pan and, stirring the mixture with a spatula or wooden spoon, heat gently to 82 degrees C to make a custard/crème anglaise which has thickened just a little to the coating a spoon stage. Pour the cooked custard into the bowl of a Kenwood mixer or equivalent and whisk at high speed until cool. The mixture should now be much thicker, pale in colour and softly creamy in texture. Gradually incorporate the softened butter which you have previously creamed to ensure it’s the right texture for easy incorporation. Keep cool if not using immediately and bring back to the right soft consistency for piping by gently warming OVER hot water. That’s it – good luck with making these at home! You are currently reading Le vrai macaron Parisien at The Rhubarb Fool.